"Ugh, never let me take three classes again." --actual words spoken to my advisor in the past week. I'm holding on tight, tapping out three long research papers and a revised short paper in the next week. Eating has gone to the back burner, but a girl's still gotta eat sometime and, oh, paying bills. 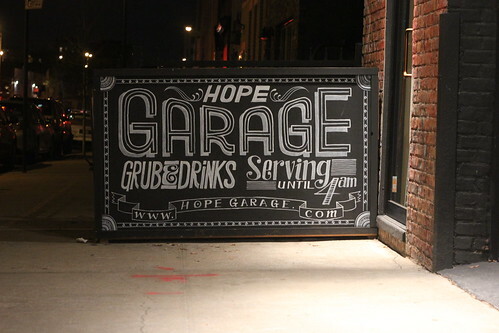 I headed to Hope Garage in Williamsburg to check it out for Citysearch. And boom! I have a new spot to hit up after playing video games at Barcade. Most people know that after an evening at Union Pool or Barcade, you're pretty much going to Kellogg's for a quick bite. I've seen things at Kellogg's. Things you don't want to know about. Now, we have Hope Garage. 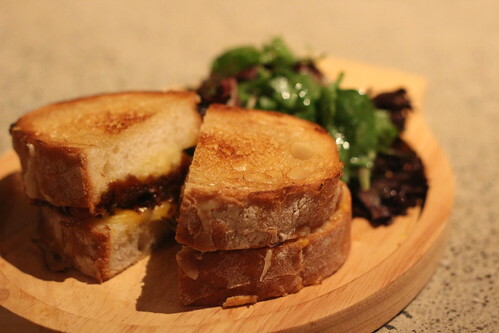 Yes, it's a bit more expensive, but this grilled cheese sandwich was on thick, soft bread and involved caramelized onions! Then there was the smoked kale with bacon. I don't even know how you smoke kale, but there were no pictures. I ate it too quickly.